When studying the Holocaust, students are engaging with complicated moral questions, many of which do not come with simple answers. Education about the Shoah encourages us to reflect on how individuals could or should act in society. 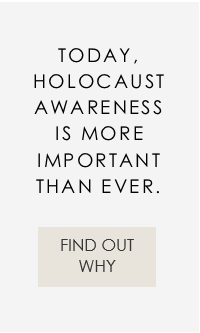 While the Holocaust provides important lessons from the past to learn for the present and the future, it significantly brings to the forefront human rights and social justice issues. The VHEC offers the following school programs to accommodate unique teaching and learning requirements and schedules. Our dynamic interactive docent-led tours and workshops include case studies about primary sources (artefacts) from our Collections and foster critical thinking skills. Recommended for students in grades 6 to 12 and classes of 30 students. Local Holocaust Survivor Speakers are available to share their Holocaust eyewitness accounts with students at schools, at the museum or by Skype. Interactive classroom-based workshops are facilitated by the VHEC docents. Although recommended for students in grades 6 to 12 and classes of 30 students, the workshop can be tailored for other groups. Symposia on the Holocaust are held each May at UBC and throughout the year in school districts across British Columbia. Students view a film excerpt and engage with a historian and a survivor speaker. Available for students in grades 10 to 12.